Modiano "poker index" designation refers to the pip (the letters or numbers in the corner of the card). 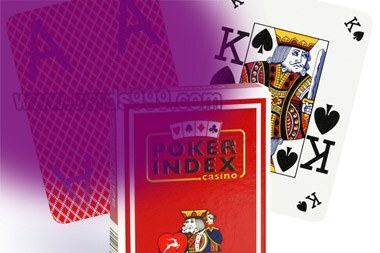 The "poker index" is a very unique index in that it features both a small index and a jumbo index which is ideal for games such as Texas Holdem. Both decks are 100% plastic and are poker size - 2.5 x 3.5.There are two ways to process the marked Modiano cards. Different colors are available. All of them can be marked as poker invisible ink marked cards contact lenses, and infrared marked playing cards. Also, they can be poker phone analyzer barcode marked cards, to work with scanner system, the poker winner predictor that can tell you who are the first winner and second winner.